Audio Surprisingly powerful bass that stays clear even at the lowest frequencies. Plenty of volume, good performance throughout its range. Design Looks good, feels better. Bendable, foldable, and light. Comfort Wearing these headphones is no less comfortable than wired in-ear headphones because there isn't a big base dangling behind your head. They are light enough that it's easy to forget that the base is around your neck. Price Headphones can get expensive, and these are priced right where they should be. Audio They're tuned for bass-heads. They sound fine across a variety of genres, but aren't made for audiophiles. Buttons Few, if any, headphones get this right, but I still don't like it. It's easy enough to play music, but everything else requires some memorization. 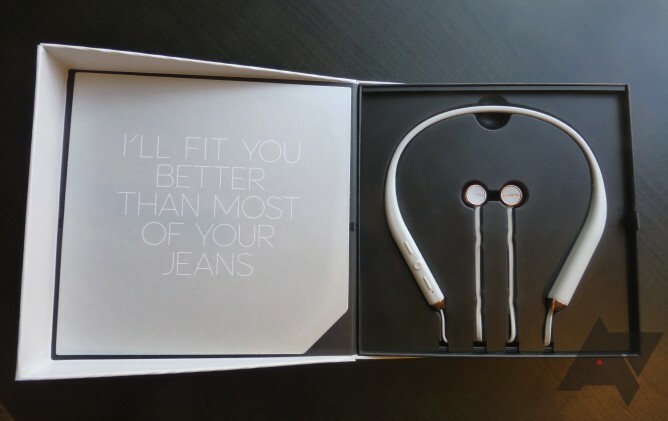 Exercise A lot of people want wireless headphones for the sole purpose of using them while they train. Shadow isn't ideal for that purpose, even if you can use it for some exercise. Range You may be able to get the promised 30 feet from the host device without losing connection, but not a step further. Your phone will have to remain in pocket. Shadow will stand out among its competitors when it comes to design. For someone wanting the absolute least added bulk compared to wired counterparts, this will not be the best option. But if you want an understated yet very handsome pair of Bluetooth headphones, Shadow might be right up your alley. Not a complete departure from the typical around-the-head design, Sol Republic gave this set a flexible body that will actually hang along your collar. For me, this is the key to them being quite comfortable. The weight is being held by my neck, rather than my ears as in Motorola’s S9/S10/S11 series. The soft touch rubber along with the malleable base make it easy to forget that it’s there, something you likely won’t experience with the rigid LG Tone Infinim. That soft rubberized exterior also contributes to Shadow really looking and feeling like a nice piece of hardware, rather than the purely utilitarian or sporty aesthetics of competitors. Further departing from the functional appearance that has pervaded this market segment are little flashes of metal that trim the cord insert and the earpieces themselves. I tend to avoid gear that might be described as ostentatious, so I was worried that the gold trim on the model I reviewed might be a little too much. Instead, Shadow’s metallic trim—which is silver on the black version—does more to add sophistication than grab attention. 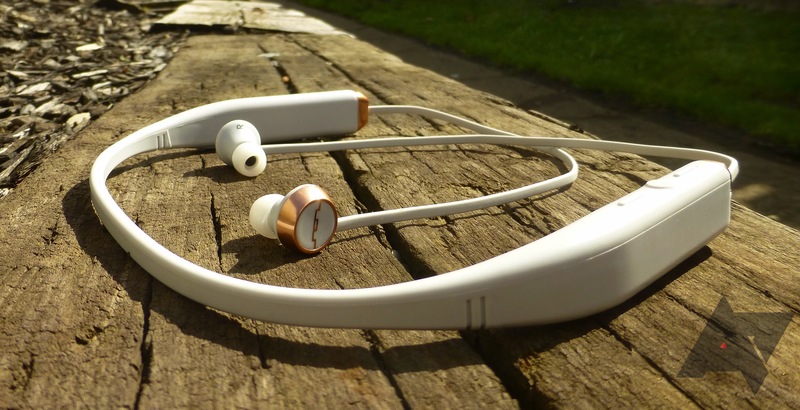 If you’re going to buy these, it should be partly because you want to wear good-looking headphones. There’s nothing wrong with that, either. Finally, I don’t want to undersell the purely use-oriented aspects of the device. 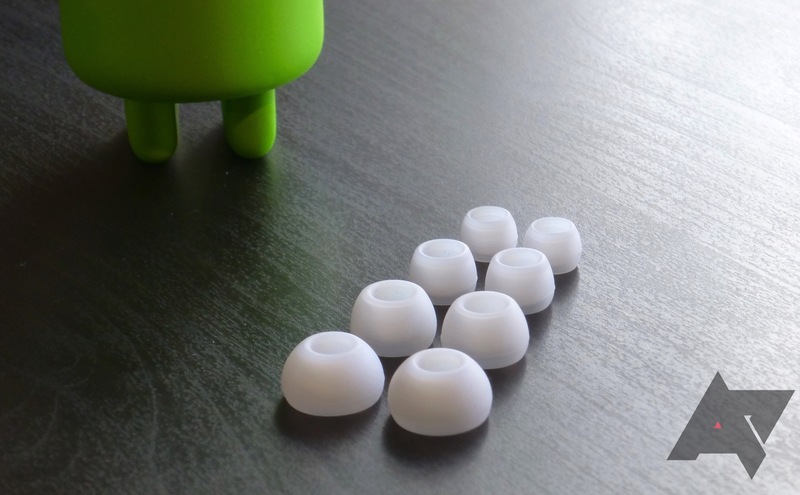 One of the major benefits of the bendable body is that you’re probably not going to break these. Roll them up, stick them in your pocket, and they’ll be just fine. I don’t advise it, but they could surely take being dropped on the ground a few times with no issues to show for it. The hard case designs of some competitors (think Motorola and LG) make them at best unwieldy to store and at worst an accident waiting to happen. 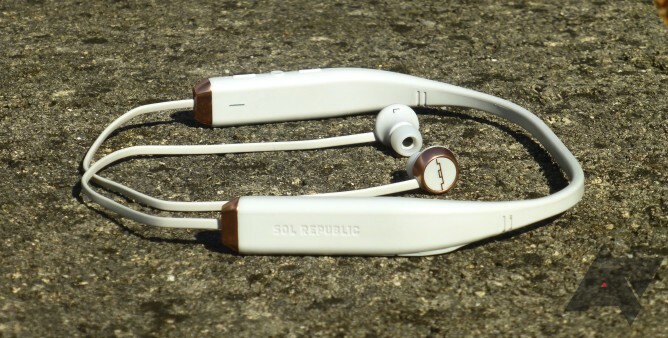 Sol Republic says Shadow is water resistant as well, so you need not panic if they get a little rain or sweat on them. Not unlike many other high- and even low-end headphones, Sol Republic supplies you with four sets of tips, including those that come equipped on the headset. The range from smallest to largest is striking. The former is truly tiny, fit for young children in all likelihood. The latter is enormous to the extent I could not get it even close to deep enough in my ear. I think most will use the set that comes installed, with some opting for the step down. Sol Republic has written right on the box that they will replace lost tips for free and for the entire life of the device, an offer which can be claimed at their website. In all my usage in the weeks preparing this review, I have never had a bud come out of my ear unexpectedly. With that said, I did not exercise with them except for a short test run. That trial showed me what I expected, which is that these are not ideal exercise headphones. The base will bounce up and down enough that it will be distracting. For most weightlifting, though, you could certainly get by with these. 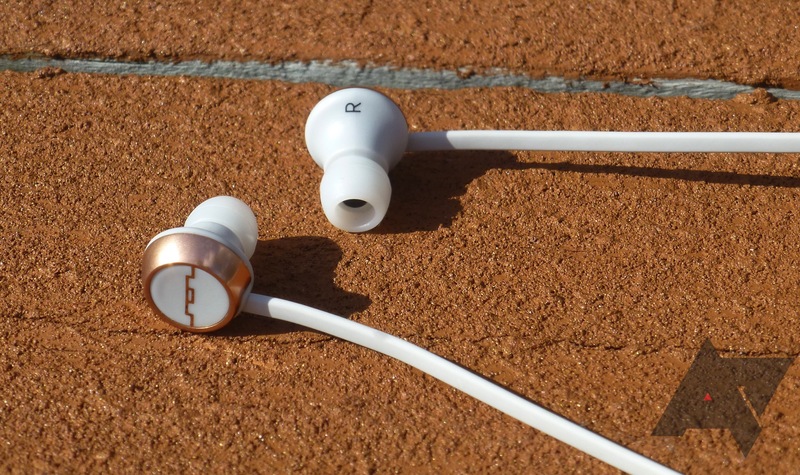 Sol Republic has suggested a sport-oriented variant may be coming in the future. If you are trying to choose a set of Bluetooth headphones and you want to be sure you will enjoy exercising in them, I would suggest getting the JayBird BlueBuds X which are far lighter, but do come with a heftier price tag. If your fitness needs are more along the lines of some casual usage, brisk walking, and non-plyometric strength training, you can still consider Shadow as it should work for those activities. Sol Republic hasn’t done anything revolutionary with the controls of Shadow. There are four physical buttons. Three of them are in a line on the top right of the base, which will probably be lying on your collarbone when you’re using the headphones. As seen below, there are two volume buttons that straddle a multi-function button. The up and down controls are not labeled and do not feel any differently from one another, so you will just have to remember that the one nearest to your face increases the volume. This is obviously not great design, but hardly a deal breaker. I’ll just cut to the chase and say I am not a big fan of the MFB. There may not be many better alternatives, and this setup is certainly preferable to even more minimal designs, but I just am not a fan of having to learn key sequences to use its basic functions. Luckily, the absolute fundamentals of listening to music are straightforward enough. Pairing is pain-free so long as you don’t plan to use more than two host devices. 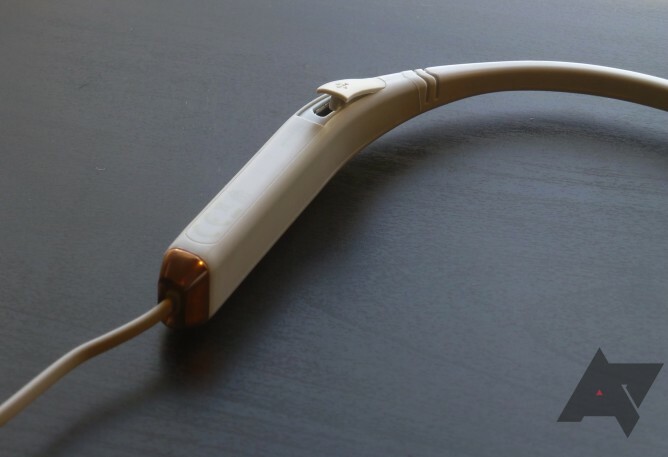 Calls are easy enough to handle if you are on the receiving end, but this is a music-first headset. If you want to receive calls and use Google voice commands to place them all day long, I think you will end up frustrated. If you just want the assurance that you won’t have to pull your phone out to answer a call and carry on a conversation, these will perform well. The on-the-box claim about battery life is that it will last for 8 hours of playback, which Sol Republic describes as “all day.” Do they last all day? I don’t know about you, but I don’t throw on a set of headphones and just listen to music for 8 hours at a time. My overall impression is that I was able to listen to roughly 8 hours of music in between charges, though. Very little battery was used when Shadow was turned on but not actively playing, which is a big plus. I once forgot to turn it off when I was done listening and I didn’t realize it until the next day, when it was still connected and well above its “low battery” threshold. With a built-in microUSB port, you probably won’t need any new equipment to charge these headphones. A cord comes in the box, but no wall plug. I have a makeshift “charging station” at my home and it is nice not having to add any cords to use Shadow, since nearly all of my other devices use microUSB as well. The indicator light on the inside of the band lets you know whether it is fully charged. If you have owned Sol Republic headphones before, Shadow offers basically what you would expect. Depending on your taste and needs, this can be a positive or negative. These won’t be an audiophile’s dream, but then again we are talking about a Bluetooth headset and one that costs only a hundred dollars. To me, “typical Sol Republic” means overall quality audio that is tuned to favor bass-heavy music, where it will perform rather admirably for most consumers. As you might expect, Shadow will support the highest quality Bluetooth audio codec currently available, aptX. It is becoming an industry standard, but if you are comparing these to more budget-minded competitors, you will want to make sure to look for aptX. For most streaming music and a great deal of the tracks most people will have locally stored, Shadow has the technological ability to deliver audio at its original bitrate, something that once held back the performance of Bluetooth headphones. Shadow certainly favors the bass and really shines in the genres where that works. A good deal of my library falls into the EDM and house categories, where these headphones are right at home. Even at the lowest frequencies, the output remains clear and rattle-free. For an in-ear headphone, the bass is top notch both in terms of clarity and overall volume. Compared to another Sol Republic product I have on hand, Master Tracks, the frequency response is flatter, which makes for a more versatile product. On acoustic and more vocal-oriented songs, Shadow’s output is not quite as impressive, given the way it is tuned. Still, throughout its range it remains detailed and full in spite of the relatively aggressive setup. One of the four included tips should work to create a pretty good seal. Annoyed with my roommate’s crunchy potato chips, I put on the Shadow without any music and found that it completely neutralized that sound. Riding a noisy and crowded public bus to work didn’t cause a problem, either; I only had to turn the volume up to about 3/4 capacity to drown out the ambient noise. This also speaks to Shadow’s maximum volume, which is far more than enough for every situation I put it into. Only a handful times did the wireless connection cause a hiccup in the playback, so little that I wouldn’t have thought of it if I weren’t reviewing them. Considering both the price and that it connects via Bluetooth, it is hard to complain about the audio quality with Shadow. Sol Republic is good at making headphones that sound a lot better than the average buds that might come in your smartphone’s box and Shadow is no different in that regard. Sol Republic’s Shadow may not be for everyone, but it will be the best option for a lot of people. It looks and feels fashionable, durable, and comfortable. The sound quality can make you forget that you’re using Bluetooth. At $99, you won’t be forced into breaking the bank, either. This is a big deal because there are not a lot of good options below that price point. Shadow delivers hundred dollar audio quality and the wireless connection is an added bonus; many competitors give you hundred dollar wireless connections and however good the music sounds is just incidental. Rather than trying to reinvent the Bluetooth IEM, Sol Republic made a set that does everything pretty well. If you are in the market for wireless headphones that you can take with you almost anywhere, these are the choice if you want the fewest compromises. The only type of user I would warn about buying these are athletes, especially runners. In that case, go for the JayBird BlueBuds X, though you’ll pay more for it. For now, you can only buy Shadow at Sol Republic’s website and Best Buy. In addition to the lighter color seen in this review (they call it “rich gray”), there is a black version as well that is more understated. Pre-orders are available for a black and red Tiger Woods edition, which will cost you an extra $20.